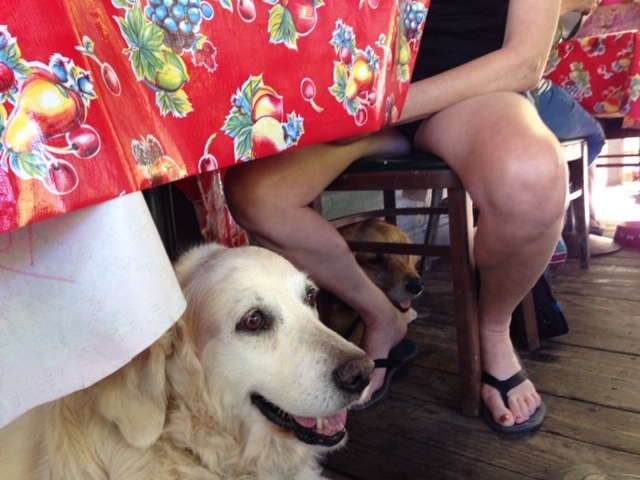 My mom recently spent a week in Italy, where she noticed dogs everywhere — in restaurants and shops, walking politely down crowded sidewalks — often stylishly clad in jackets. She mentioned multiple times that the sidewalks were spotless. In chatting with other dog-loving and well-traveled friends, we heard stories of other European countries where well-dressed dogs hobnobbed with humans in restaurants, stores, and even historic homes that the humans were touring. Obviously, the dog culture is very different in Europe than in the U.S.
I’m not criticizing, just observing. I am as guilty as the next dog owner. Many times, I’ve decided not to take Cali into, say, our local dog-friendly Ace Hardware because I just want to get my shopping out of the way. She loves going in, and she’s not horribly behaved — but she puts a lot of effort into looking for employees whom she can hit up for cookies, and I do have to watch her to make sure she doesn’t shoplift those dog treats that are in a nose-level bin. I’d love it if she just calmly walked by my side, ignoring the treats, but I haven’t put in the effort needed to get her to that point. In my service-dog-training days, I took many, many puppies on many, many trips to stores, restaurants, and every kind of public place. In those instances, I was 100 percent focused on the puppy, not trying to do my own errands, and I taught the puppies to behave properly (I hope). It takes a lot of effort, though it’s well worth it. I admire the European owners who’ve managed to combine training with living their lives. Obviously, behaving calmly in various situations will come more easily to some dogs than to others, but all puppies need to be taught. Taught to settle down quietly and not demand attention while the humans are eating or talking. Taught not to search for and pick up scraps of food or trash. Taught not to beg at restaurant tables. Taught not to seek attention from strangers. These are, of course, skills that are valuable at home, too, especially when the doorbell rings or a repair person is working in the house.